In no particular order, below are list of links to Chelsea Fan sites and blogs that you might find of interest. If you would like your site added to our list, please contact us here. The Chelsea Football Fancast – broadcasts live every Monday 7-9pm. Up the Chels! cfcuk Fanzine – it’s only a pound! 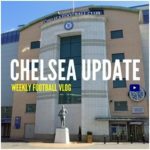 Chelsea Fans Channel on YouTube – regular output of news, interviews, match reports, and more!